Human-induced forest fires have increased by hundred percent in the country during the last year, Disaster Management Ministry sources revealed. According to statistics presented by the Ministry, 58 cases have been reported where wildfires have been caused by individuals where as in 2018, it has doubled into a 102. It was also pointed out that, most alarmingly, 50 cases pertaining to human-induced wildfires have been reported by April 2019. These observations were made at a press brief held at the Disaster Management Ministry premises recently. 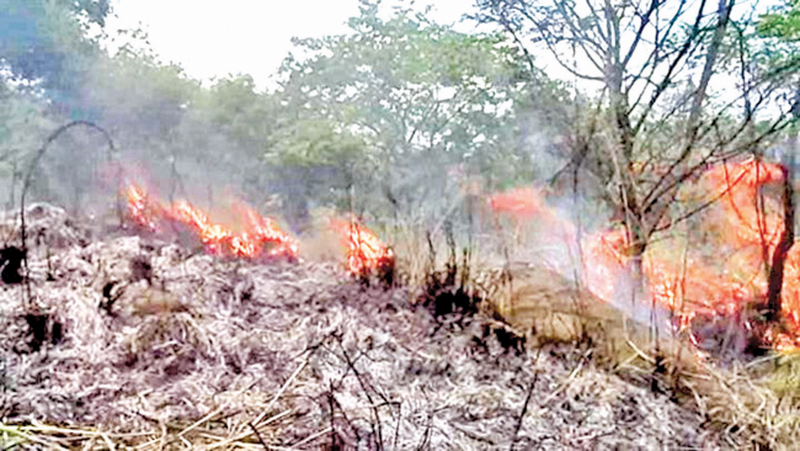 “Accordingly, strict action will be taken against those who induce wildfires under the Forest Conservation Act, Additional Conservator General of Forests at Forest Department Lal Abeygunasekara said. A special programme has already been launched by the Forest Department together with the Sri Lanka police, military service, Special Task Force, government and political establishments in order to build awareness among the general public urging them to refrain from engaging in such destructive activities,” Abeygunasekara further said. “The laws against those who caused forest fires are extremely severe. So we are trying our best to build awareness among the general public to minimize such man-made disasters. We request the public to immediately inform us about any wildfires via the emergency Numbers 117 or 119,” Abeygunasekara explained. Abeygunasekara also pointed out that no natural wildfires erupt in the country. All the wildfires that erupt are human-induced, he pointed out. Considering the adverse dry conditions prevailing in the country, Abeygunasekara urges the public to stay vigilant about wildfires and inform the authorities. According to the Forest Conservation Act, any individual who trespasses or causes trespass, kindles or keeps any fire or leaves any fire burning or causes any fire or allows any fire to spread or carries any fire shall be guilty of an offence and be liable on conviction to imprisonment for a term not exceeding five years or to a fine not exceeding Rs.100,000 or to both.